The Taganrog Combine-Harvester Factory was established in 1915. Later it became part of a large Soviet agricultural engineering group and in 1995 - member of Doninvest Finance & Industry Group. The factory still holds its monopoly on production of driving axles for the whole combine-building industry of Russian Federation. The axles are standardized and compatible with all combines produced in the CIS states. One of the best products of the factory is the all-new combine KZSR-5 RUSSIA, which is equipped with a rotary threshing separating unit and an automatic electrical device, making hydraulic floating of the field surface in longitudinal direction. 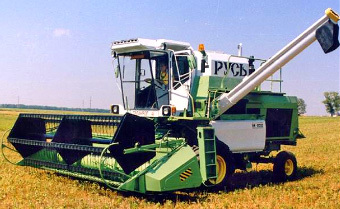 Other distinctive features of this combine harvester are its high capacity - up to 10 tons per hour with losses behind the thresher of only 1% and a low degree of grain damaging. The production line includes two models of combine harvesters; several trailed harvesting devices, attachments for sunflower and corn harvesting, driving axles and spare parts. As part of its restructuring, Doninvest stopped the production of combines in 2005. To make its products more competitive, the factory plans to modernize both combines and start the production of a semitrailer for passenger car transportation.